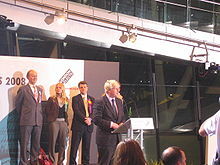 The London mayoral election, 2008 for the office of Mayor of London, England, was held on 1 May 2008 and was won by Conservative Party candidate Boris Johnson. It was the third London mayoral election, the previous elections being the first election in May 2000 and the second election in June 2004. Boris Johnson became the second Mayor of London and the first Conservative to hold the office since its creation in 2000. This became the first London Mayoral election in which the incumbent mayor was defeated by a challenger. The popular vote achieved by Boris Johnson remained the largest polled by winning mayoral candidate until Labour candidate, Sadiq Khan, received 1,148,716 first-preference votes in 2016. Increase of 8.38 percentage points. On 27 September 2007, Boris Johnson was announced as the Conservative candidate, having received 75% of the vote in an election open to the entire London electorate. The primary election was originally to be held in October 2006. Candidates who applied by the 4 August deadline included Richard Barnes, London Assembly member for Ealing and Hillingdon, who withdrew in July 2007 and announced his support for Boris Johnson; Andrew Boff, former Hillingdon and Hackney London Borough Councillor; Nicholas Boles, Policy Exchange think-tank director, who withdrew in July 2007 for health reasons; Dr Robert Frew, a cultural policy and management specialist; Victoria Borwick, Kensington and Chelsea London Borough Councillor; Warwick Lightfoot, also a Kensington and Chelsea councillor; and Lee Rotherham. Steven Norris, Conservative mayoral candidate in 2000 and 2004, ruled himself out. Broadcaster Nick Ferrari also ruled himself out, having considered seeking the nomination. Come the 4 August 2006 deadline, however, Conservative Party Chairman Francis Maude announced the process was being delayed for six months to allow time for further candidates to submit applications. Prospective applicants who subsequently publicly declared were Lurline Champagnie, a London Borough of Harrow councillor; Winston McKenzie, a former boxer; and disc jockey Mike Read. Read withdrew in July 2007 following a change in the voting system for Conservative candidates, giving his support to Johnson. In April 2007 the Conservative party confirmed it had approached former Director-General of the BBC Greg Dyke. Dyke stated he would not stand except on a joint ticket with the Liberal Democrats. The Liberal Democrats stated this would be against its party's constitution. Around this point former Conservative Prime Minister Sir John Major was considered a possible candidate, but he turned down an offer from David Cameron. Following media and members' criticism over the party's selection procedure, the party chairman announced a revised timetable requiring a candidate to be in place before the party conference at the end of September 2007. In June 2007, the party published a detailed timetable confirming that the result of the selection process would be announced at 10 a.m. on 27 September 2007. On 16 July, shortly before the noon deadline for nominations, Johnson confirmed he would seek the Conservative nomination. A final four of Johnson, Boff, Borwick and Lightfoot were chosen on 21 July for the primary election, which Johnson won. On 3 May 2007 the Labour Party announced Ken Livingstone, the incumbent mayor, had been selected as their mayoral candidate. The announcement was made following consultations with London Labour Party members. Following a split in the RESPECT Party at the end of 2007, the George Galloway-led faction (also referred to as Respect Renewal) retained the rights to the use of the name in elections, as Linda Smith was registered as party leader with the Electoral Commission. The Socialist Workers Party dominated faction put forward Lindsey German under the Left List banner. Galloway's faction did not put forward a candidate, but Galloway declared his support for Ken Livingstone. In July 2007, the English Democrats Party announced that talkSPORT presenter Garry Bushell had been nominated as a candidate to stand against Ken Livingstone in the 2008 election. In January 2008 Garry Bushell stepped aside (due to work commitments) in favour of Fathers-4-Justice Campaigner Matt O'Connor, who successfully stood against Andrew Constantine, a City of London Banker, in a selection contest. O'Connor was also their last London-wide list Assembly candidate. O'Connor withdrew on 25 April, after he fell out with the party over leadership, campaign funding and tactics. The Liberal Democrat candidate was former police chief Brian Paddick. The party drew up a shortlist in September 2007 with a final choice made by a one member, one vote ballot of party members. Simon Hughes, the party's 2004 mayoral candidate, did not stand. On 13 November 2007 it was announced Paddick had been selected from the shortlist, defeating Chamali Fernando and Councillor Fiyaz Mughal. On 9 May 2007, the British National Party announced that Richard Barnbrook, leader of the opposition on Barking & Dagenham Borough Council, and a member of the party's National Advisory Committee, had been selected to stand for election in 2008. At the UK Independence Party (UKIP) 2007 party conference, Gerard Batten who is the UKIP MEP for the London region was selected to contest the London Mayoral Election. In October 2006, UKIP announced that talkSPORT presenter James Whale might stand against Ken Livingstone in the 2008 election. The government's media authority Ofcom told Whale that becoming Mayor would prevent him from continuing his radio show. Whale subsequently stated on his programme he would not be the UKIP candidate, but he did not rule out standing for election. On 12 March 2007 the party announced that it had selected Siân Berry as its mayoral candidate in a ballot of its London members, receiving 45% of the vote. The other candidates were Shahrar Ali, Shane Collins, Katie Dawson and Terry McGrenera. Berry was also one of their Assembly candidates. In December 2007 former boxer Winston McKenzie told the BBC that he intended to stand for Mayor of London as an independent on an anti-gang crime platform, having failed to secure the Conservative nomination earlier in the year. On 12 February Alan Craig was selected by the Christian Choice Party to stand in the Mayoral election. The Christian Choice Party are an alliance between the Christian Party and the Christian Peoples Alliance. There were a significant number of people who claimed that they were planning to stand, but did not submit valid nomination papers. The One London Party announced that their leader, Damian Hockney, would be their candidate in 2008 but on 27 March 2008 Hockney withdrew from the mayoral race. He blamed a lack of media opportunities for smaller parties such as his, and claimed the race was "a media election, fought just in the media". The London listings magazine Time Out announced it planned to recruit a self-financing candidate to stand on a manifesto agreed by its readers. In February 2008 it confirmed that columnist Michael Hodges would be its candidate, standing on a reformist ticket. However, he decided not to stand, citing the bureaucratic legislative requirements for candidates and instead pledged to "fight on" to open the system up to ordinary Londoners to stand as independents. In March 2007 following widespread speculation that John Bird, founder of The Big Issue, would seek the Conservative nomination, he announced that he would stand as an independent, on a platform of "social inclusion". In October 2007, he withdrew from the race and instead promised to launch a new social movement around tackling poverty. Chris Prior planned to stand on a platform to abolish the congestion charge for the London Assembly but pulled out of the mayoral race shortly before the close of nominations. On 21 February 2008 Dennis Delderfield announced he would stand for the New Britain Party. He said he would abolish the Mayoral office and the Greater London Authority (GLA). He did not submit a valid nomination. John Flunder was to be the Senior Citizens Party candidate for Mayor of London but did not submit a valid nomination. LondonElectsYou.co.uk, a social networking site aimed at selecting a member of the public to contest the election with a £50,000 campaign budget, was set up in March 2008. The winning candidate did not submit any nomination however, with the site's founder David Smuts claiming that electoral authorities' bureaucratic obstructions failed to get them the required access to the electoral register to validate their nomination. In April 2007 Richard Fairbrass, the lead singer of pop band Right Said Fred, announced that he may stand for Mayor of London on a platform of opposition to the London congestion charge. In December 2007 peace protester Brian Haw was reported to have announced his intention to stand for Mayor of London as "the only Pro Peace candidate" but nothing to support this appeared on his website. The supplementary vote system is used for all mayoral elections in England and Wales. Under this system voters express a first preference and (optionally) a second preference. If no candidate is the first choice of a majority of voters (i.e. more than 50%), the top two candidates proceed to a second round. Voters whose first choice has been eliminated have their second preferences scrutinised, in order to determine which of the remaining candidates is favoured by a majority of all voters who have expressed a preference between the two. This gives a result whereby the winning candidate has the support of a majority of votes cast (at least by those who expressed a preference among the top two). Various parties recommended a variety of second preferences to their supporters. Labour and the Greens announced a second preference pact, urging Livingstone supporters to give their second choice vote to Berry and vice versa. Left List also encouraged their supporters to vote Livingstone second, while the BNP encouraged theirs to vote Johnson second, although Johnson stated during the campaign that he did not want the second choice votes of BNP supporters. Brian Paddick was regularly pressed through the campaign to recommend a second preference choice to Liberal Democrat voters, with Livingstone and the Labour Party keen to be chosen, but Paddick refused to make such a recommendation, revealing after the election that his second preference vote was for the Left List. Votes were counted using an optical scan voting system, where a computer scans the ballot papers and registers the votes. A digital image of the ballot paper was also taken so if there were problems with any of the papers, they could be examined by humans. In 2008, due to the large turnout, the counting took over 15 hours. However, if counted manually the process could - according to London Elects - take up to 3 days. Election observers have declared "there is insufficient evidence available to allow independent observers to state reliably whether the results declared in the May 2008 elections for the Mayor of London and the London Assembly are an accurate representation of voters’ intentions." London Elects have been unable to publish an audit of some of the software used in the count. The Open Rights Group reports that there was equipment directly connected to the counting servers to which observers had limited or no access and that the presence of error messages, bugs and system freezes indicates poor software quality. ^ "Johnson Wins London Mayor Race in Body Blow to Brown". Bloomberg.com. 3 May 2008. Retrieved 19 April 2010. ^ "2008 election results for the Mayor of London and the London Assembly". London Elects. 2 May 2008. Retrieved 17 February 2013. ^ "London Elects". London Elects. 1 May 2008. Retrieved 4 May 2012. ^ "Johnson is Tory Mayor Candidate". BBC News. 27 September 2007. Retrieved 11 May 2010. ^ "Richard Barnes pulls out and backs Boris". ConservativeHome LondonMayor Blog. ^ Woodward, Will (4 August 2006). "Norris opts out of Tory primary contest for London mayor". GuardianOnline. Retrieved 11 May 2010. ^ "Ferrari Will Not Be Tories' Mayor". BBC News. 2 August 2006. Retrieved 11 May 2010. ^ "Tories delay London mayoral race". BBC News. 4 August 2006. Retrieved 11 May 2010. ^ "Mayoral fight for boxer's brother". BBC News. 7 November 2006. Retrieved 11 May 2010. ^ "DJ Read joins 'X factor-style' Mayor race". London: Daily Mail. 2 January 2007. ^ Read, Mike (17 July 2007). "I'm Backing Boris". London: Comment is Free (Guardian Online). Retrieved 11 May 2010. ^ Dowell, Ben (18 April 2007). "How the 'Greg Dyke for London mayor' story snowballed". The Guardian Online. Retrieved 11 May 2010. ^ "Fallout From the London Nightmayor". Iain Dale. ^ Deedes, Henry (20 April 2007). "Tories at war over Cameron's failed bid to get Greg". London: The Independent Online. Archived from the original on 9 December 2007. Retrieved 11 May 2010. ^ "Conservative candidate to be announced at Party conference". ConservativeHome LondonMayor Blog. ^ "Mayoral Selection Timetable". ConservativeHome LondonMayor Blog. ^ "Boris Johnson standing for mayor". BBC News. 16 July 2007. Retrieved 11 May 2010. ^ "Tories Select Mayoral Shortlist". MayorWatch. Archived from the original on 9 December 2007. ^ "Livingstone Confirmed as Labour Candidate". MayorWatch. Archived from the original on 16 May 2007. ^ Galloway, George (25 January 2008). "Why I back Red Ken". London: Comment is Free (Guardian Online). Retrieved 11 May 2010. ^ "Opik 'won't run for London mayor'". BBC News. 1 August 2007. Retrieved 11 May 2010. ^ "Richard Barnbrook Adopted as Mayoral Candidate". British National Party. Archived from the original on 30 September 2007. ^ "Radio host 'could challenge Ken'". BBC News. 24 October 2006. Retrieved 11 May 2010. ^ "Whale again rules out being UKIP London Mayor candidate". Democracy. Archived from the original on 2 November 2013. ^ "Berry is Green mayoral candidate". BBC News. 12 March 2007. Retrieved 11 May 2010. ^ "The Next Mayor of London". New Statesman. ^ "'I'll knock out the opposition'". BBC News. ^ "Mosque critic brands himself the 'Christian choice' for mayor". thisislondon.co.uk. Archived from the original on 13 February 2008. Retrieved 14 February 2008. ^ "Politics | Hockney quits London mayoral race". BBC News. 27 March 2008. Retrieved 19 April 2010. ^ "The Battle to be Mayor of London - Time Out London". Timeout.com. Archived from the original on 23 July 2008. Retrieved 19 April 2010. ^ "Help Hodges 2008". Archived from the original on 25 February 2008. Retrieved 20 February 2008. ^ "Time Out's Mayor Battle Goes To Parliament". Timeout.com. Archived from the original on 11 June 2008. Retrieved 4 May 2012. ^ Duff, Oliver (8 March 2007). "Bird's the word to stop Ken (but don't mention it until April) - Pandora, Columnists - The Independent". London: News.independent.co.uk. Archived from the original on 9 December 2007. Retrieved 19 April 2010. ^ "Politics | Big Issue founder targets poverty". BBC News. 18 October 2007. Retrieved 19 April 2010. ^ "Abolish the Congestion Charge". Stopcc.com. Retrieved 19 April 2010. ^ "Events Programme 2008". New Britain. 1 May 2008. Retrieved 19 April 2010. ^ "Senior Citizens Party". Senior Citizens Party. Archived from the original on 9 October 2007. Retrieved 19 April 2010. ^ Jacquie Bowser (4 March 2008). "Livingstone faces social networking rival in mayoral race". Brandrepublic.com. Retrieved 4 May 2012. ^ "LondonelectsYOU!". Archived from the original on 9 July 2017. Retrieved 16 September 2018. ^ "Right Said Fred: I'll stand for London Mayor - News - Evening Standard". Thisislondon.co.uk. 18 April 2007. Archived from the original on 6 April 2009. Retrieved 4 May 2012. ^ "UK Indymedia - London Mayor 2008". Indymedia.org.uk. Retrieved 19 April 2010. ^ "London elections May 2008". City Mayors. Retrieved 19 April 2010. ^ "Brian Haw Peace Protester". Parliament-square.org.uk. Retrieved 19 April 2010. ^ "Kable - Observers criticise London e-count - 2 July 2008". Kablenet.com. Archived from the original on 5 April 2009. Retrieved 19 April 2010. ^ Bobbie Johnson, technology correspondent (2 July 2008). "London mayoral election: doubts over 41,000 votes counted by machine". Guardian. Retrieved 19 April 2010.